Report says the U.S. tried to cover up the killings of six children and other civilians as monitor group says airstrikes have killed 250 civilians so far. The United States military has been accused of the killing of six children and three more civilians in Syria as part of an airstrike the U.S. air force had carried out back in August in the north city of Atmeh, an exclusive report by the Middle East Eye website said Thursday. 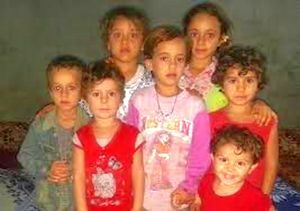 Six of these children were killed in a US airstrike. The accusation was made by the father of the six children, Muawiyya al-Amouri, who told the Middle East Eye that the U.S. government was trying to cover up the deaths of his family members as well as refugees who were staying at his home at the time. “A plane belonging to the alliance shelled my house with six missiles. They destroyed my house and my children died. I had some refugees in my home from Ariha [near Idlib city] who died as well,” Amouri said. Amouri, who was not in the house at the time, said that five of his daughters had been killed: Fatimah, aged 10; Hayat, aged nine; Amina, aged seven; Asia, aged five and Marwa, aged four; as well as his 10-month-old son Abdullah.The accusations were previously made by other relatives of Amouri back in August against the U.S., according to a report by the New York Times then, and Washington had ordered an investigation into the incident. However, Thursday’s report said the U.S. Central Command is now saying the killings did not take place and the airstrikes in Atmeh targeted the Islamic State group there. Syria observers and analysts also stress that neither the Islamic State group nor al-Qaida-affiliated Nusra Front, which has also been targeted by the U.S.-led coalition, have presence in Atmeh. “It’s not Nusra, it’s not a Nusra affiliate. There is not an (Islamic State group) staging area near. They are well to the east,” Robert Ford, a former U.S. ambassador to Syria, told the Daily Beast website in August following the airstrike. In September, the U.S. and 10 of its regional allies formed an anti-Islamic State group coalition that has so far carried out more than 2,800 airstrikes in Syria. The U.S. military has carried out more than 95 percent of those airstrikes, according to Reuters. However, since the beginning of the operation in Syria, the U.S. Defense Department has only admitted in May to one incident in which Syrian civilians were killed: the killings of two Syrian children in a November 2014 airstrike near the Harim city. However, the United Kingdom-based monitor group Syrian Observatory for Human Rights said Wednesday it had documented the killings of at least 250 civilians by the U.S.-led coalition in the period between September 2014 and November 23, 2015. 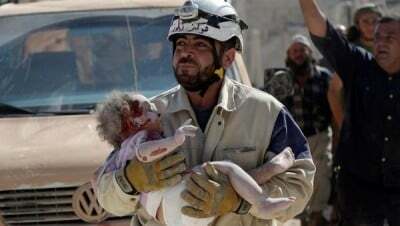 The group also said that at least 3,952 people have been killed in the US-led campaign in Syria. Comment: The children died tragically, a massacre without warning and without reason. Excuses? Denial? Cover up? There was no ISIS, no Nusra Front. And, the US response was to say these killings never took place? How low. How callous. How despicable and self-serving to deny the deaths and therefore responsibility for them.